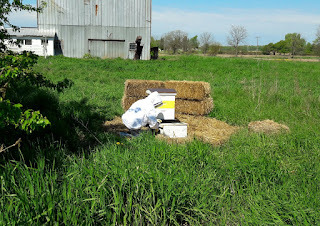 Saturday we went up to Greenville to get the bees. Only one escaped on the ride home, but she stayed in the back window. When we arrived home I put my bee coat on and carried them out by the hive. I should have let them rest for a little while but I thought I'd open the front and let them fly around and get acclimated to their new location. I pulled some of the staples off the screen covering in the front. When I started pulling the screen away from the corner they started flying out. I should have just left it at that little corner but I ripped it completely open and they really flew out, it was like a black cloud! After I ripped it off I just stood up and slowly walked away. Jim had been standing on the other side of the fence taking photos but when I walked back he was already moved closer to the house and of course the bees were following me and they started getting in his hair. I brushed them out and told him we needed to go inside for awhile to let them calm down. We got in the house and Jim discovered he had a bee in his shirt! No one got stung, thankfully, but Jim did have a stinger in his arm but not in deep enough to hurt him. So after they rested for a couple hours I got my smoker and all my new bee tools together and went out and moved the frames into the new hive box. They were alot easier to be around when I was using the smoker. Still had a few flying around me but most were staying on the frames. I didn't see the queen but I didn't take too much time to look at them. I just wanted to move them and let them get settled again. 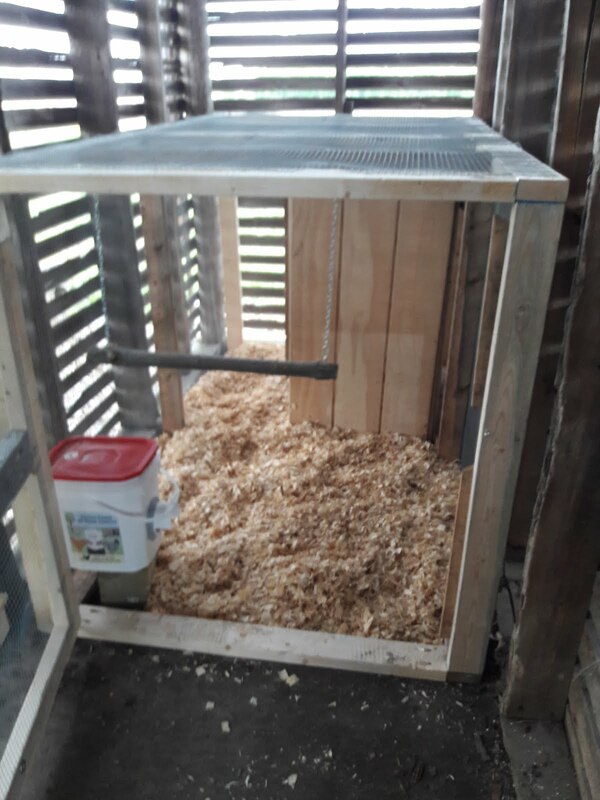 I put the entrance reducer on the front set to the very small opening, I also put a jar of sugar water on top of the frames so they can have some food to help produce wax to build out the frames. 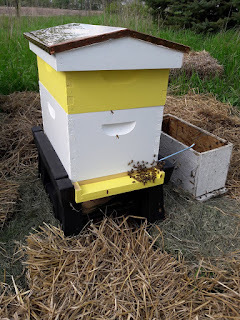 I have not bothered them since I got them in the new hive. I do need to add some more food for them but I'll have to do it sometime after work in the next couple days. I'm very excited to have them here on the farm! 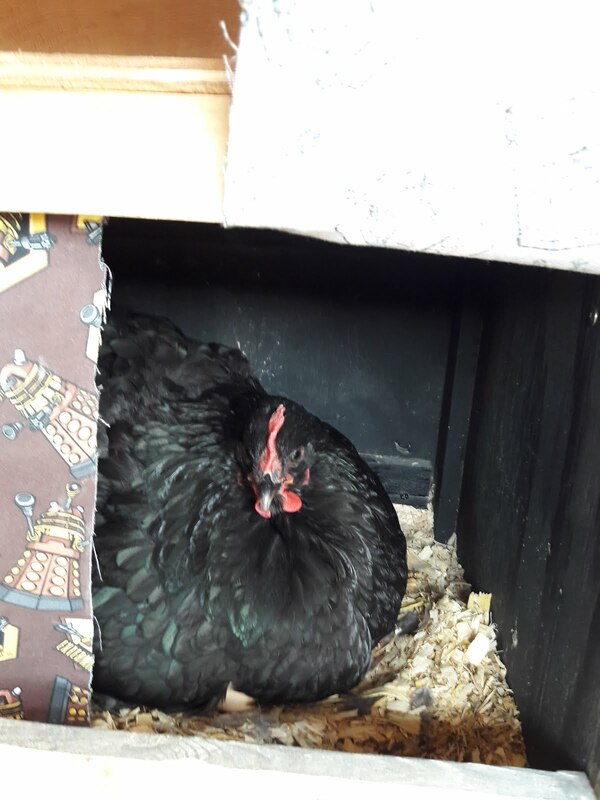 So Lucille decided she wanted to go broody! This means she had been sitting in the nest box for a few days non stop. Usually they will lay a bunch of eggs then get down to business and incubate them. During which time they stop laying any more eggs. 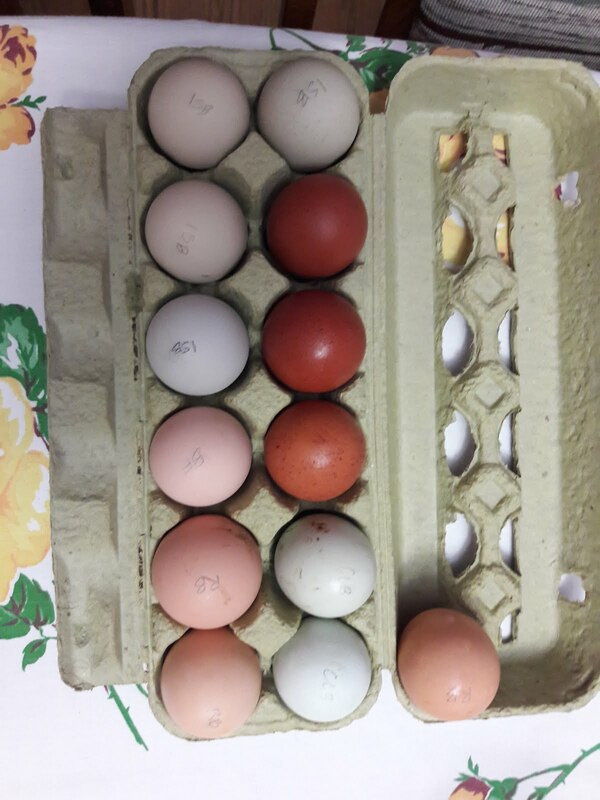 I slipped a couple of Laverne's eggs under her and one day when I was feeding her some treats she stood up and I felt under her to see how many eggs there were....just the two I had put under her! 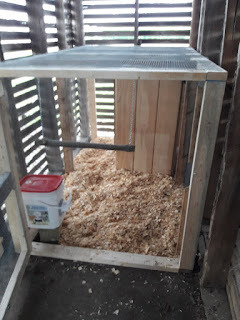 I had ordered some fertilized eggs on EBay and while they were traveling I built Joe a new home inside one of the ends of the Corn Crib Carport. He has a nice area to roost that is sheltered from the elements and a great swing to roost on during the day! Then I got the eggs in the mail, too many to put under one hen but I think I ended up putting 9 or 10 under her which is still a lot I think! I got an assortment of a few different breeds. So when they arrived I moved Lucille into the small coop then next morning. I set her on the eggs but she got up right away. She was not happy about being moved. I left her closed up inside for the day and when I got home she was up on the roost! So I opened it up and let her out in the yard and she made her way back over to the big coop and was drinking some water. 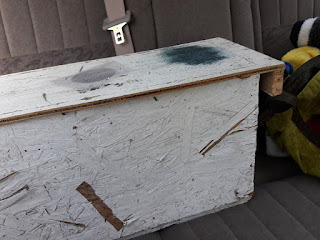 I knew she would go right back into her old favorite nest box, so I quickly moved the eggs to that box and sure enough later she was in there sitting on them. I figured I would just leave her and if they hatch I can move mom and chicks to the other coop then. I'm not sure if she knows well enough what she needs to be doing, When I moved her to the small coop I took Laverne's eggs that I had put under her a week prior and candled them under a flashlight and I didn't see any of the telltale veins along the shell indicating growth. So this may be a big flop. We will see what happens around June 1st.